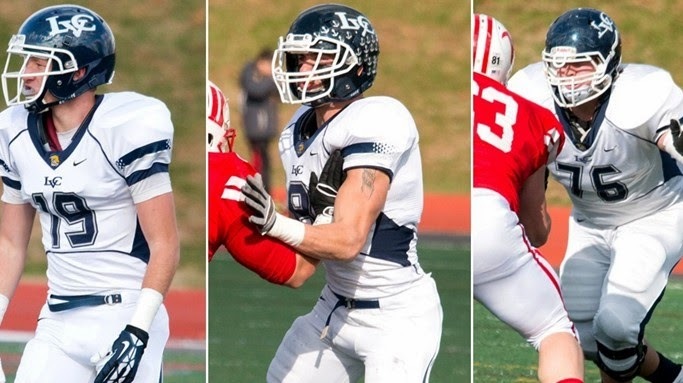 ANNVILLE, Pa. - Lebanon Valley seniors Tyler Dean, Frank Gaffney, and Zach Wierman have garnered invitations to the Dream Bowl senior all-star game. The trio were identified as among the nation's outstanding seniors, and received invitations to play in the game on Jan. 19 in Virginia Beach. Last year, Joey Miller '14 and Kevin Smith '14 both played in the game, joined by LVC's honorary captain Levi Hain, who participated as part of the Coach to Cure MD program. Dean, a senior tackle, will spend his fourth year starting on the offensive line in 2014. He is the active leader in starts among LVC players with 29 in his career, and he has helped LVC be a part of a pair of postseason appearances while anchoring one of the MAC's best rushing and protection units in his last three seasons. Gaffney, a senior outside linebacker, earned all-America honors in 2013 and has received a bevy of preseason accolades this summer. He is coming off an 82-tackle, 13-sack season in 2013 that saw him become a finalist for the Cliff Harris Trophy while being named the MAC Defensive Player of the Year. Wierman, a senior cornerback, will start his his third season in 2014 after leading the secondary last year with seven break-ups. He picked off two passes and made 35 tackles (two for a loss) as a junior. Wierman was a MAC Academic All-Conference selection last year. Lebanon Valley (8-3 in 2013) starts its season Saturday at Franklin & Marshall.